There’s no difference now between eBay’s holiday sales season and offline retailers’ – November and December are the hottest months of the year. Pump up your eBay holiday sales with these tips to make the holidays your hottest season too. Online holiday shoppers start early so you need to, too, if you want to increase your eBay holiday sales. If you’re using 10-day listings and put your first listings up October 15th, that only gives you six to eight cycles of listings to maximize your holiday sales. Make sure you have reliable suppliers lined up in advance so you have the product you need to maximize your eBay holiday sales. You need to know where or not you’ll have a product in stock before you can promote it – and sell it. Think “gift, gift, gift” – and if someone wouldn't buy it as a gift, don’t list it. For instance, suppose you sell beading supplies and jewelry made out of beads. To increase your eBay holiday sales, focus on the jewelry, not the supplies. The jewelry is a much more likely gift purchase. What’s hot in the world at large is what’s hot on eBay, too. For example, if you were selling iPods on eBay during the 2004 holiday season, you did well. One way to increase your eBay holiday sales is to add popular items to your product listings. Find out what’s hot on eBay itself by using the tools eBay offers. eBay lets you view what's in demand in top selling categories. 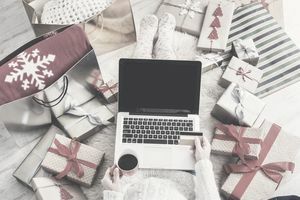 If you can be ahead of the curve (or even in the first wave) with some of these hot items, you'll increase your eBay holiday sales dramatically. The holiday season is prime time for impulse buys – and impatience. Using more Fixed Price listings rather than auction-style listings will give your products an edge with those impatient, impulsive online shoppers who don’t want to wait for your auction to end. Offering free shipping gives online shoppers even more inducement to buy your product. Who doesn’t like a free bonus? Coupling free shipping with Fixed Price listings is an especially powerful way to increase your holiday sales. And be sure to offer combined shipping for multiple items. It saves buyers money - encouraging them to buy more. Even if you don’t do it regularly, you should accept payment through PayPal as one of your payment options throughout the holiday season if you want to increase your eBay sales. When online shoppers pay through PayPal, the transaction is instantaneous and when you speed up payment, you speed up shipping. Two other great reasons to accept PayPal; it will give you tools to track and ship your goods and, if you don't already, it will let you accept credit cards without opening a merchant account. Online shoppers don’t just want to buy gifts; they want to know when those gifts are going to arrive. When you make sure that your shipping policies are clearly explained in your listings, you make it easier for them to decide to buy your product. Otherwise, they have to take the time to email you and ask – or just buy someone else’s product. Be aware that regular mail slows down during the holiday season. To increase your eBay sales over the holiday season, choose shipping methods that guarantee service within a certain number of days even if they cost a little more. The important thing is helping your customers hit their holiday deadlines by keeping your shipping promises. Also, make sure that you inform last-minute shoppers if what they’re buying won’t arrive in time and of any additional shipping charges. When it comes to increasing holiday sales, every little bit helps. While making sure your pages have a holiday theme won’t make any eBay sales in itself, it will help put online shoppers in a holiday buying mood.